A post-doc once told me that to understand biochemistry and immunology, he had to pretend that he was a molecule. We want to know how lipid molecules, specifically single and double chain amphiphiles, interact with each other and solvent when they are added to water. Before you read the answer, look at the image below and ask yourself the question: What would I do if I were a single chain amphiphile ready to jump into water? A single chain amphiphile jumps into water! The micelle interior is completely nonpolar. Spherical bilayers that enclose an aqueous compartment are called vesicles or liposomes. Micelles and bilayers, formed from single and double-chain amphiphiles, respectively, represent noncovalent aggregates and hence are formed by an entirely physical process. No covalent steps are required. The formation of these structures can be understood from the study of the intermolecular forces (IMFs) involved as well as thermodyamics. First we will review the IMFs involved. Consider the attractive forces. The buried acyl chains can interact and be stabilized by London forces. They are sequestered from water. This view fits our simple axiom of "like-dissolves like". The polar head groups can be stabilized by ion-dipole bonds between charged head groups and water. Likewise H-bonds between water and the head group stabilizes the exposed head groups in water. Repulsive forces may also be involved. Head groups can repel each other through steric factors, or ion-ion repulsion from like-charged head groups. The attractive forces must be greater than the repulsive forces, which lead to these molecular aggregates. One problem arises with this simple explanation. For a micelle or bilayer to form, many monomers must aggregate to form a single micelle or vesicle. This suggests that micelle and vesicle formation should be entropically disfavored! Common single chain amphiphiles that form micelles are detergents (like sodium dodecyl sulfate - SDS) as well as fatty acids, which themselves are detergents. NaOH feels slippery on your skin since the base hydrolyses the fatty acids esterified to skin lipids. The free fatty acids then aggregate spontaneously to form micelles which act like detergents. Liposomes produced in the lab can be unilamellar, consisting of a single bilayer surrounding the internal aqueous compartment, or multilamellar, consisting of multiple bilayers surrounding the enclosed aqueous solution. You can image the multilamellar vesicles resembles an onion with its multiple layers. Cartoons of unilamellar and multilamellar liposomes are shown below, where each concentric circle represents a bilayer. Liposomes vary in diameter. They can be generally categorized into small (S, diameter < 25 nm), intermediate (I, diameter around 100 nm), and large (L, diameter from 250-1000 nm). If these vesicles are unilamellar, they are abbreviated as SUV, IUV, and LUV, respectively. Their various sizes are shown below, in comparison to other large biological structures. In this lab, we will make and characterize LUV. The chemical composition of liposomes can be widely varied. Most contain neutral phospholipids like phosphatidyl choline (PC), phosphatidyl ethanolamine (PE), or sphingomyelin (SM), supplemented, if desired, with negatively charged phospholipids, like phosphatidyl serine (PS) and phosphatidyl glycerol (PG). In addition, single chain amphiphiles like cholesterol (C) and detergents can be incorporated into the bilayer membrane, which modulates the fluidity and transition temperature (Tm) of the bilayer. If present in too great a concentration, single chain amphiphiles like detergents, which form micelles, can disrupt the membrane so completely that the double chain amphiphiles become incorporated into detergent micelles, now called mixed micelles, in a process which effectively destroys the membrane bilayer. In lab (for those that take it) you will make liposomes containing only natural PC from fresh egg yolk. Remember, the two fatty acids in naturally occurring phospholipids can be of a multiple of lengths and degrees of unsaturation. The average fatty acid composition of egg yolk PC (average molecular weight = 750) is shown in the table below, obtained from Liposomes: a practical approach, edited by R.R.C. New. Given the large degree of unsaturation at C2, what do you expect the transition temperature of a liposome composed only of egg yolk PC to be? (Vesicles made using more saturated PC from mammalian sources have Tm of around 40oC.) This high degree of unsaturation makes egg yolk PC very susceptible to oxidation, which could alter the properties of the liposome dramatically. Synthetic PC made with saturated fatty acids could alleviate that problem. The properties of liposomes (charge density, membrane fluidity, and permeability) are determined by the lipid composition and size of the vesicle. The desired properties will be, in turn, determined by the use of the particular liposome. The vesicles offer wonderful, simple models to study the biochemistry and biophysics of natural membranes. In fact, membrane proteins can actually be incorporated into the liposome bilayer using the exact method you will be using. But apart from these purposes, liposomes can be used to encapsulate water soluble molecules such as nucleic acids, proteins, and toxic drugs. These liposomes can be targeted to specific cells if antibodies or other molecules which will bind specifically to the target cell can be incorporated into the bilayer of the vesicle. Intraliposomal material may then be transferred into the cell either by fusion of the vesicle with the cell, or by endocytosis of the vesicle. Since phospholipids will spontaneously form some type of bilayer structure when placed in water, most efforts in liposome production involve producing vesicles with the desired size, lamellar structure, and physical characteristics, which as previously stated is controlled both by liposome size and chemical composition. Also, ways must be developed to entrap the desired molecule inside the vesicle in the most cost-effective manner, and with minimal leaking of contents. All methods of production involve four steps: 1) drying of organic solvent-solubilized lipids; 2) dispersion of the lipids in the appropriate aqueous solution; 3) separation of liposome from excess starting reagents; and 4) characterization of the vesicles for chemical composition, Tm, permeability, size, etc. Purified lipids of the desired composition (often times egg PC:cholesterol:PS in molar ratios of 0.9:1.0:0.1) are dissolved in a purified, water-free organic solvent mixture (often chloroform/methanol, 2:1 v/v) and dried down in a round bottom flask on a rotary evaporator under reduced pressure (using a water aspirator) and slightly elevated temperature (20-40oC). The rapid rotation of the flask will ensure that the lipid is dispersed over a large surface area, and will increase the rate of evaporation. To remove the last traces of solvent, the dried flask is usually placed under a high vacuum overnight. If a small volume (< 1 ml) of lipid solution is used,, the solvent can be evaporated under a stream of nitrogen. To avoid entrapment of residual chloroform in the lipid film, the film is dissolved in t-butyl-methylether diethyl ether , and dried several times. Alternatively, the residual solvent can be removed under high vacuum. There are three main methods of dispersing the lipids into an aqueous solution to form liposomes. a. mechanical dispersion - in this method, lipid dried onto the inside glass surface of a container is hydrated with an aqueous solution, which literally peals off the lipid to form multilamellar - MLV - (multiple bilayers separated by water) vesicles. Only a small part of the aqueous solution is encapsulated inside the liposome, so this is not the method of choice for the encapsulation of expensive or rather insoluble solutes. Depending on the degree of agitation and the nature of the lipid used, different sized liposomes can be prepared. These multilamellar liposomes can be further processed to form unilamellar liposomes by several techniques. These include probe or bath sonication of the MLV, extrusion at high pressure of the MLV through membrane filters of defined pore size, or pH-induced vesiculation in which a transient change in pH destabilizes the MLV in favor of unilamellar liposomes. Another technique involves fusion of SUV by repeated freezing and thawing or by fusion of SUV containing acidic phospholipids (such as PS) through Ca2+ mediated aggregation. b. organic solvent dispersion - In these methods, the lipids, which are dissolved in organic solvents, are injected through a fine needle, at a slow rate, into an aqueous solution in which the organic solvent may be miscible (such as ethanol) or immiscible (such as ether). In each case, the lipids orient at the interface between the organic solvent and aqueous solution, to form bilayer structures. Injection of ethanol-dissolved lipids provides a simple way to produce SUV, but because liposome formation can not occur at an ethanol concentration greater than 7.5%, only a fraction of the total aqueous phase can be entrapped in the vesicle; hence this technique is not cost-effective for entrapment of an expensive solute. Alternatively, the lipid can be dissolved in ether and slowly injected into an aqueous solution which is warmed so that the ether evaporates at the rate at which it is injected. Since the ether is volatilized, large amounts of lipid can be introduced and encapsulation efficiency of the aqueous solution is high. c. detergent dispersion and solubilization - In this method, lipids are solubilized in an aqueous solution through the addition of detergents. The detergents are removed slowly from the solution, resulting in the spontaneous formation of liposomes. Detergents are single chain amphiphiles that spontaneously form micelles in aqueous solution when the concentration of free lipid rises to a minimum critical value, the critical micelle concentration (CMC); at this concentration, self-association of detergent results in the formation of a stable aggregate, the micelle. This is illustrated in the figure below, along with the CMC of several different detergents. In this procedure, lipid is deposited in a small container. An aqueous solution is then added, containing water-soluble molecules for encapsulation. Detergent is then added at a concentration in excess of the lipid concentration and greater than its CMC. The lipid molecules are then "emulsified" in the detergent micelle. The solubilized mixture is then placed in a semi-permeable dialysis bag, which is placed in a large volume of an aqueous solution. The free detergent in solution is in equilibrium with the detergent in the micelle. The bag contains microscopic holes large enough for the monomeric detergent molecule to pass through, but small enough so that the large micelle can not. The lipid, during this process, is embedded in the micelle forming a detergent-lipid mixed micelle. As dialysis continues, the monomeric detergent partitions throughout both the volume in the bag and the volume surrounding the bag, while the mixed micelle remains in the bag. If the aqueous solution surrounding the bag is changed several times with fresh solution, the equilibrium in the bag is shifted to the monomeric form. Alternatively, detergent-adsorbing beads (such as Bio Bead SM-2 by Bio-Rad) can be placed in the aqueous solution surrounding the bag to speed up the process of detergent reequilibration. Eventually, all the detergent is in this form, and during the process, which occurs slowly, the lipid in the mixed micelle self-associates to form a liposome. A detergent of low monomer molecular weight and a high CMC is most desirable for this method of liposome production. Another method of removing the free detergent is through gel filtration chromatography. In this technique, molecules of disparate molecular weights can be separated from each other. An explanation follows this discussion. This method of formation of unilamellar liposomes is the method of choice if membrane proteins are to be inserted into the liposome bilayer for the purpose of targeting the liposome. It is not the best method, however, for quantitative encapsulation of expensive soluble molecules. Once the liposomes are formed, they must be separated from free monomeric lipid, detergent, and unencapsulated solutes. This can be done again by dialysis, or more readily by gel filtration chromatography. Macromolecules of different sizes can be separated on a column in which the stationary phase is a polymerized agarose or acrylamide bead, which contain pores of various sizes. A small molecule (such as monomer detergent, free lipid, or small aqueous solute) in the mobile phase (aqueous buffered solution) may enter the pores in the bead, while a larger macromolecule or aggregate (such as a large protein, a micelle, or a liposome) may not, due to size restriction. The result is that a larger fraction of the overall volume of the column is available to the smaller molecules, which thus spend a longer time on the column and are eluted by the mobile solvent after the larger species. We will study the theory of gel chromatography in a future experiment. Liposomes can be characterized both chemically, to determine the average lipid and protein makeup of the bilayer, and physically, to determine the size, permeability, lamellarity, and amount of encapsulated material. Size is usually determined by electron microscopy or indirectly by light scattering from these large species. In this lab, instead of characterizing the lipid makeup of the liposome, which you know to be composed only of PC, you will perform thin layer chromatography on a series of phospholipids. You will also determine whether you have encapsulated an solute in the liposome. Many different kinds of amphiphilic molecules can be induced to form aggregates like micelles and bilayers, or to form unique aggregates on designed surfaces. One recent example is the formation of vesicle bilayers of potassium salt of pentaphenyl fullerene (Ph5C60K) in water. The anions form stable spherical vesicles with about 12,000 anions in a structure of average radius of 17 nanometers. The link above shows a bilayer vesicle model with about 12,000 molecules. A sector has been cut out for enhanced visibility. The hydrophobic fullerene bodies are shown in green, the hydrophilic- charged cyclopentadienide regions are in blue. If fatty acids are so insoluble in water (and must form micelles to become dispersed in water), how do they move around the blood and be delivered to tissues that need them? There are two main transport vehicles to allow lipid movement in the blood. For free fatty acids released from fat (adipose) tissue after intracellular hydrolysis of triacylglycerides, the fatty acid is bound to the most abundant blood serum protein, albumin. This protein can bind many fatty acids for each albumin protein. We will study protein structure and binding interactions in subsequent chapters. More complex lipids like triacylglycerides, cholesterol, cholesterol esters, and phospholipids are transported in large vesicles like structures called lipoproteins. These, as their name implies, contain protein (on the surface) and lipids. Since they need to carry nonpolar molecules, their inside contains no water. The outside consists of a monolayer of phosopholipids and cholesterol esters, while the insides contain more nonpolar lipids. 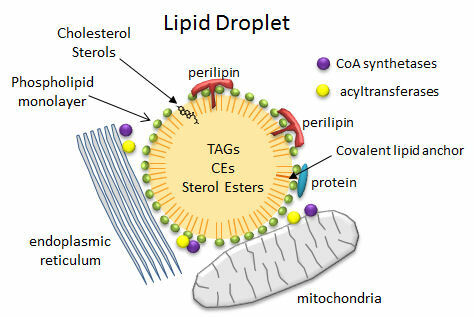 In contrast to the common single and double chain amphiphiles, which have charged atoms in their head groups and which form micelles and bilayers, respectively, triacylglycerides (TAGs) and cholesterol esters (CEs), which are almost completely nonpolar, coalesce into lipid droplets in cells. These droplets can range from the very big, which are found in adipocytes (fat cells) where they take up almost all of the available space and where they are used for energy storage, to small, which are found in all cells, where they are used mostly for membrane biogenesis and energy mobilization. When esterified into esters, fatty acids and steroids also pose less potential toxicity to cells. Lipid droplets are often found in close approximation or attachment to mitochondria, endoplasmic reticulum (ER) and peroxisomes (where plasmalogens with ether-linked fatty acid instead of ester-linked are synthesized), all organelles intimately involved in membrane and energy biochemistry. Many of the enzymes (acyltransferases for example) required for TAG metabolism are found in the mitochondria and the ER. Acyl CoA synthetases and acyltransferase: These enzymes activate free fatty acids for metabolic processes. It appears that LD arise from the ER which are involved in membrane biogenesis and "trafficking" of membranes to different locations in the cell. Korlach et al. Characterization of lipid bilayer phases by confocal microscopy and fluorescence correlation spectroscopy PNAS, 96, pg 8461 (1999) Zhou et al. Spherical Bilayer Vesicles of Fullerene-Based Surfactants in Water: A Laser Light Scattering Study. Science. 291, pg. 1944 (2001).